We finally have managed to cut a tooth. And boy is it hard work! In all honesty the last few days have been a nightmare. Bee has been burning up and whinging and whining all day long. Shes been off her food too. As she's usually a happy carefree girl it's been a complete shock to us all. And what makes it worse is that she had finally stopped her 2am feed but because she's been off her food she was waking up almost every 2 hours again for a bit of milk. And she wanted to join us in our bed because she has been feeling so miserable. So I am back to feeling like a complete and utter zombie. However, I'm glad she's finally getting her teeth. She's going to be a year old in just over 2 weeks and I was beginning to worry as she had no teeth. It also seems like she may be getting more than one, I guess that's better; get the sleepless nights over in one go. I've been giving her Calpol, Bonjela and teething powder. The teething powder worked great with Munchkin but they don't seem to be doing much for Bee. What are your tips for dealing with teething symptoms? Any miracle cures out there? 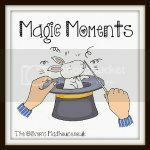 I am linking up this post with The Olivers's Madhouse Magic Moments linky. Although Bee is suffering, it is still a magic moment that she's getting teeth; she's growing up!! YAY for teeth but booo boo to teething. Teething is awful, and so horrible for little babies. Z used to go through a cycle every few weeks. We found bickie pegs and anbasol liquid really useful and a very very cold raw carrot just to numb their gums a bit. wow i so wish i had a miracle for you honey, even though its a milestone and a half its frustrating its so painful! Tough times ahead for both! But at least it’s good teeth are coming. My doctor did not advice anything only rubbing the sore part with my fingers. Mister Pop does not have any yet, he is just chewing everything he can!